Since i recently started this segment called makeup 101 for all my viewers who are just starting out with makeup, i figured that a post about drawig a winged liner would be alot beneficial! I recently poste the first episode under this segment about basic makeup brushes for a begiiner which you can read HERE. Winged liner is one of the glamorous classics in makeup in conjunction with a red lip. You can give it a mordern twist by drawing it with a coloured liner or just stick to the black. In today’s tutorial I’m using elf’s liquid liner in black which I had reviewed HERE. Step 1 i usually start with the flick as it’s much easier to trace the shape this way. In order to understand where to draw your flick, you need to visualise a connection from your lower lashline. Your flick can be as long or short depending on your preference! Step 2 start drawing the line at the inner corner. You should always start your winged liner thin and later on thicken the line as you get to the end. Step 3 connect the line from the inner corner with the end of the flick you placed earlier. Step 4 this step is pretty easy. You just got to fill in the space in-between the outline! Step 5 if your flick was crooked or not looking as you wished it would, dip in a Q tip with makeup remover and clean the edge. Step 6 fill in any spaces you have left off. 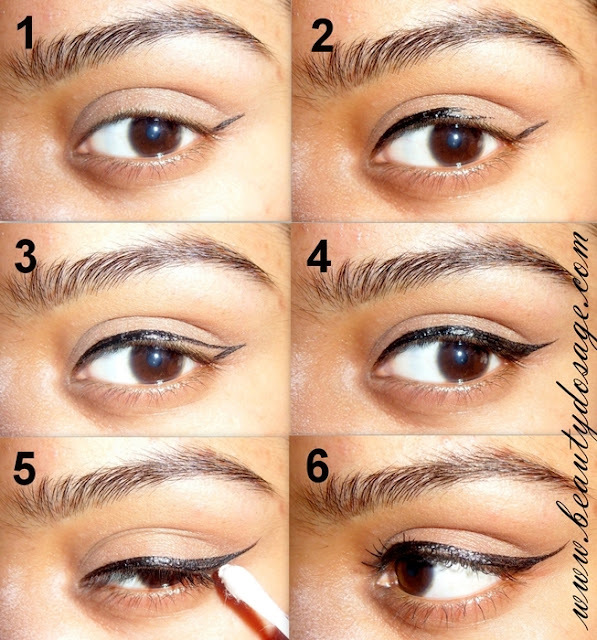 You can also go over the liner with a gel liner to intensify the black. That’s it girls. Liner is a real deal and takes time to perfect as well. It’s been pretty long since i got into makeup and i still need to clean up my wing with a Q tip! So don’t worry if yours is messed. Wow really pretty eyeliner.Your so good with winged eyeliner! Looks so perfect!